Title: "Conflict Prevention and the possibility of reconciliation in Kosovo"
Title: "Imperial Pathways: Africa and Russia in the 20th Century"
"Постмодернистские тенденции в современной казахской литературе"
"Диалог культур в творчестве Бахытжана Канапьянова"
Title: "Slavic in the Language Map of Europe: Questions of Areal Typology "
The Institute of World History is a leading institute in historical studies of Russia and the Soviet Union in China. 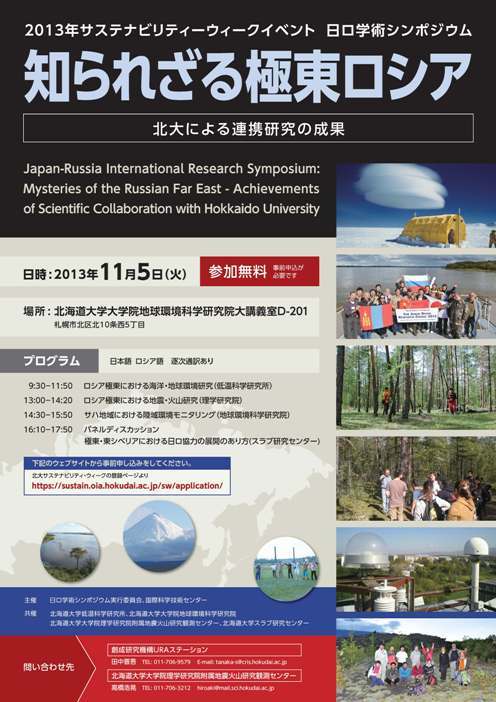 We will share recent research interests and historiography in Japan and China. Адрес: Москва, Николоямская ул., 1, ВГБИЛ, 4 этаж. При желании участвовать в конференции просим связаться с Го Косино (gkoshino@slav.hokudai.ac.jp) по электронной почте заранее. 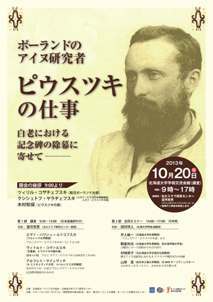 Title: "Modernities Scrutinized: Finland, Japan and Russia in comparison"
Title: "The Achievements of Bronisław Piłsudski "
The Making of a Global Man. Who and what was Bronisław Piłsudski? 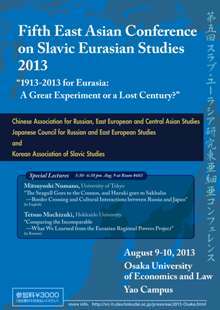 Peculiarities of Belarusian Authoritarianism and Its Influence on Regime Dynamics in Russia and Ukraine"
Title: "Russian Elections and Manipulation of the Election Results"
"Regional Development in Sakhalin, Russia and Business Exchange with Hokkaido"
"Региональное　развитие　Сахалинской　Области　и экономическое　сотрудничество　с Хоккайдо"
PROGRAMME： Address - Prof. N. Baba, Dean at Faculty of Eng. Gratitude - Prof. Y. Nawa, Vice-Dean at Faculty of Eng. 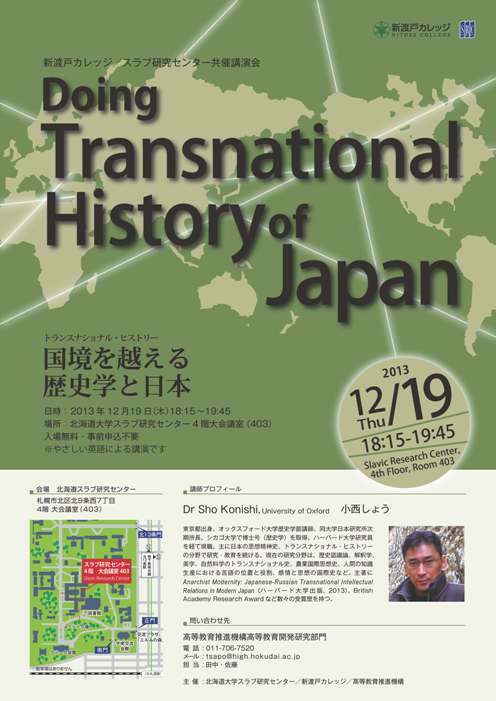 Moderator - Prof. T. Setoguchi at Faculty of Eng. 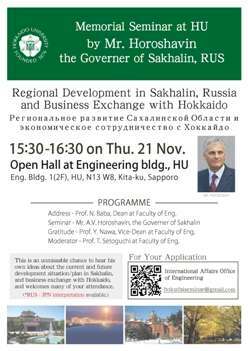 This is an unmissable chance to hear his own ideas about the current and future development situation/plan in Sakhalin, and business exchange with Hokkaido, and welcomes many of your attendance. 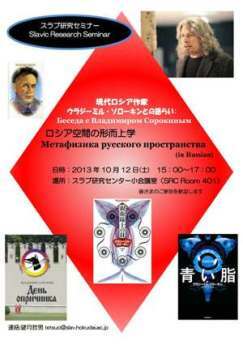 Language： RUS - JPN interpretation available. "Основные тренды в постсоветской историографии Башкортостана и Татарстана"
"Историография истории и истории культуры в Узбекистане в период независимости"
Supported by: JSPS Grants-in-Aid for Scientific Research A "Comparative colonial history: colonial administration and center-periphery interactions in modern empires"
Place： The University of Tokyo, Hongo Campus, Room 113, Faculty of Law & Letters Bldg.1. 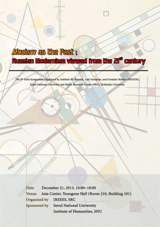 "Modern as the Past: Russian Modernism Viewed from the 21st Century "
"What's In a Language Name? 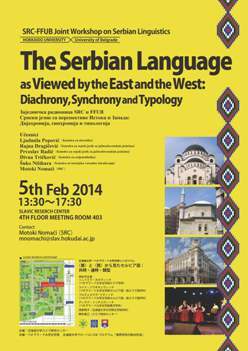 The Case of Bosnian, Croatian, Montenegrin, and Serbian"
as Viewed by the East and the West: Diachrony, Synchrony and Typology"
"Serbian Language Today: the Main Issues"
This special lecture will be held as a part of the biannual meeting of JSSSLL.